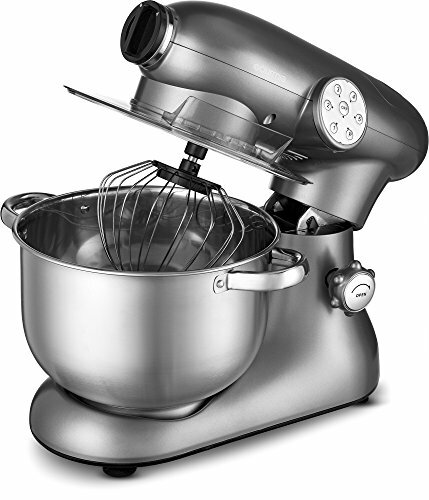 Artisan Extra Large 7-quart Kitchen Mixer, STRIKING DESIGN, STUNNING PERFORMANCE, AMAZING RESULTS! One of the few arts Europeans admire as much as design, is the art involved in preparing and presenting a gourmet meal. EuroPrep was founded by-and for those select few who appreciate and admire both. That's why special care was taken to ensure no element of any of its seamless design would be at the expense of any of its phenomenal functionality. Whether you admire it for its food prepossessing mastery or for the masterpiece of design it so clearly represents your EuroPrep Mixer is one of its kind... in more ways then one. Engineered to the same demanding standards as our mixer and precision optimized to 'bring out the best' in our attachments- and your recipes, this stainless steel bowl holds a true 7 quarts and mounts securely for maximum safety and stability Combine that with its super tough splash guard/feeder and you can see what makes us superior by design. All attachments feature unique no-stick finish. The unique design of our dough hook ensures that more of your ingredients end up in your dough hook and not on the sides of the mixing bowl. Because it's almost perfectly round it delivers optimal aeration, a key part to "whipping up" magically light meringues, phenomenally flawless frosting's and of course wonderful whipped creams. No matter if its desserts or even mashed potatoes the results will be nothing short of unbeatable.